Make me hot or cold. With vit C. Just add water. Suitable for vegetarians. 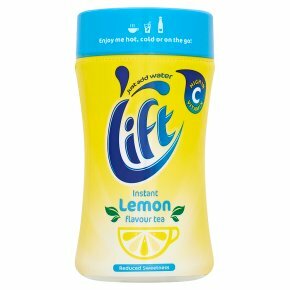 Kosher.Give yourself an instant lift with the tangy refreshment of a delicious lemon flavour tea drink. Drink it hot or cold for a unique taste experience! For refreshment in an instant, put two heaped teaspoonfuls of Lift in a mug, add hot water and stir. Alternatively, for a refreshing cool drink, add chilled water, a cube or two of ice and stir.